If you prefer relaxed casual style, why not test drive this combination of a navy and white tie-dye dress shirt and Etro white capri pants? The whole getup comes together perfectly when you complete this outfit with beige leather heeled sandals. If you're in search of a casual yet totaly stylish getup, choose a white and red and navy sleeveless top and Etro white capri pants. As well as totally comfortable, both of these garments look great paired together. Black suede heeled sandals will instantly smarten up even the laziest of looks. If you're on the hunt for a casual yet absolutely chic getup, team a black coat with white capri pants. As well as super comfortable, these two items look fabulous when worn together. To bring out a sassier side of you, complete your look with brown leopard suede ballerina shoes. If you're in search of a casual yet seriously stylish ensemble, reach for a camel coat and Etro white capri pants. As well as super comfy, these pieces look amazing when paired together. 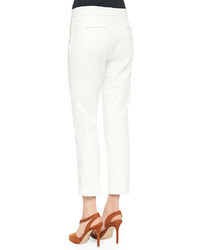 If you're looking for a casual yet stylish getup, consider teaming a navy turtleneck with Etro white capri pants. Both garments are totally comfortable and they will also look fabulous when worn together. When it comes to shoes, this look is complemented nicely with black leather ankle boots. If you're looking for a casual yet totaly chic outfit, make a black coat and Etro white capri pants your outfit choice. Both garments are very comfortable and they will also look great when worn together. When it comes to shoes, this ensemble pairs nicely with black leather ankle boots. If you're looking for a casual yet totaly stylish outfit, consider wearing a blue coat and Etro Cuffed Cigarette Capri Pants White from Bergdorf Goodman. As well as super comfortable, these two pieces look great when paired together. Silver leather platform loafers work wonderfully well with this outfit. 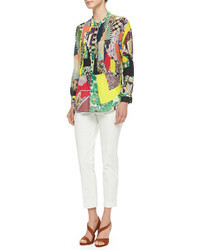 If you're looking for a casual yet stylish ensemble, rock a white fur collar coat with Etro white capri pants. As well as super comfy, these garments look wonderful when worn together. Beige leather pumps complement this getup very nicely. If you're searching for a casual yet absolutely chic outfit, dress in a navy coat and white capri pants. These items are totally comfortable and will look great paired together. Dress down your ensemble with white leather low top sneakers.